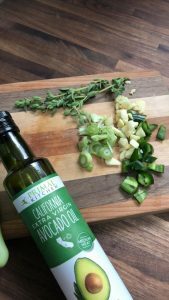 I love chimichurri and I’ve got a great keto chimichurri recipe that is amazing with just about anything you put it on! You can go the traditional route and put it over steak, but it’s a perfect complement to chicken, fish and veggies, too! If you’re new to chimichurri, it’s a sauce or marinade traditionally made with oil, vinegar, garlic & parsley. It has huge flavor and is really easy to make at home. One of my favorite things about chimichurri (other than the killer flavor) is that there’s no cooking required! That’s right – everything goes right into the blender raw! I decided to kick it up in both health & flavor by using Primal Kitchen’s avocado oil & jalapeno. If you give it a try, leave a comment and tell me what you paired it with and what you thought! Add all these items into your blender or food processor. If you have a weak blender, chop the ingredients more finely. I’m in love with my Vitamix blender – I basically threw everything in whole. Serve over chicken, beef, fish or veggies. You can also use this as a marinade! 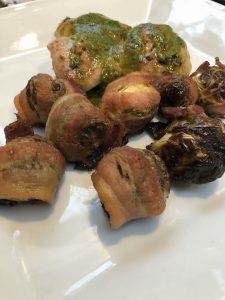 I simply drizzled it over chicken thighs and dipped my bacon-wrapped brussels in it! Delish! * I get these items from Thrive Market because they are less expensive there. If you give them a shot, register through thrivemarket.com/primalpotential so you can save an extra 25% on your first order, plus get free shipping on that initial order! Plus, it’ll hook you up with a free 30-day trial membership! Patience, grasshopper. It’s coming. 🙂 Ingredients: bacon. brussels sprouts. Wrap and bake at 400. Time depends on the thickness of your bacon and size of your sprouts. Mine cooked for about 30 min.